The City Council Housing Committee held a meeting Tuesday to discuss the proposed Affordable Housing Overlay. Mayor Marc McGovern speaks to to the council on the issues at hand. In a recent meeting, the Cambridge City Council Housing Committee discussed the Affordable Housing Overlay proposal currently working its way through city government. The proposal seeks to reform zoning laws to streamline the approval process for affordable housing units, incentivize affordable developers, and introduce other reforms designed to increase the supply of affordable housing for Cambridge residents. It is heartening to see that Cambridge is finally looking to engage in serious action to tackle the problem of housing accessibility. 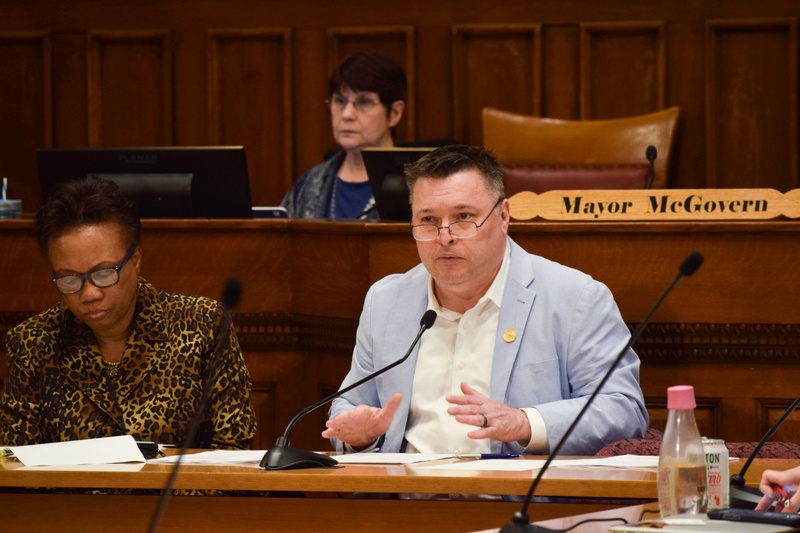 We are hopeful that this measure will increase the supply of affordable housing around the city, ease the process by which that housing pool can be further expanded, and bring down ever-rising prices. Nevertheless, the City Council must be scrupulous in its assessment of the actual effects of this reform, especially in terms of potential adverse legal, safety, and environmental effects. Councilors at the meeting expressed concerns about the proposal’s potential environmental impacts, including less-stringent building standards and potential tree removal. While we are sensitive to these and other environmental concerns and believe they should be deeply considered, the city must prioritize socioeconomic diversity and support over other interests that have little significance if a vibrant community is not present to reap the benefits. Councilor Dennis J. Carlone, a former architect and urban design consultant, also questioned the city’s ability to effectively deliver promised improvements on building capacity and cost management. Carlone’s skepticism, in so far as it supports the mission of the proposal but challenges the Council to buckle down on logistics, mirrors our own perspective. Nevertheless, the City Council must work quickly. Carlone’s questions, while critical, must be responded to with haste. The City Council must balance the need for effective reforms with efficient implementation. To that end, we encourage both a streamlined approval process and rigorous oversight. On its face, this may seem like a contradiction, but the scale of the plan presents Cambridge with an advantage in this context. Approvals granted to developers for some affordable housing units can be testing grounds for those developers’ future projects. In keeping with our call for oversight to ensure the success of the proposal, those who fail to deliver buildings on budget that offer decent, affordable, and safe living accommodations must not be considered for further developments across the city. This proposal offers a chance for the City Council to take stock of housing in our city and ensure the legacy of a diverse and vibrant Cambridge faithful to its roots for decades to come. Residents must step up and own that process, continuing to be vocal in Council meetings, and the City Council in turn must listen carefully and seriously to its residents’ concerns and suggestions. In doing so, the City Council should also adopt an approach that is cognizant of the ways in which Cambridge is changing at a neighborhood-level as well. Protecting affordable housing is important, but it must come alongside reforms oriented toward protecting affordable neighborhoods — places where not just rent but also food, clothes, and other necessities are marketed to residents of all socioeconomic status. Only in this way can Cambridge guarantee a real community of belonging for all its residents — someplace, to use the old cliche, that everyone can call home.